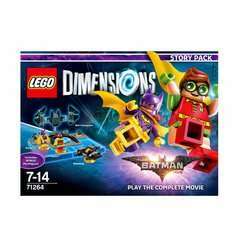 All lego dimensions bogof @ smyths toys. Movie sets come to £16.49 each. As per title. Bogof. Cheaper than argos and Sainsbury's. The little man has these on Santa's list. the story packs in my local sainsburys are the same price bogof. Also bogof at Argos if that's easier for anyone. Compare prices. Argos seems most expensive... Especially the movie sets. Any suggestion for the best ones to get? Story packs give you most followed by level packs then fun packs. The Lego Batman Movie story pack was great fun. Ghostbusters and Batman or Harry Potter would seem to offer most bang for your buck. Ghostbusters and Batman or Harry Potter would seem to offer most bang for …Ghostbusters and Batman or Harry Potter would seem to offer most bang for your buck. Lots of ghostbusters around. It's the one that's produced most. Seriously went to order these, added to my basket. Went to pay and...... the item I have ordered is now out of stock! What?? Within 6 seconds?? I was only buying 2 of the new fun packs, therefore cheaper at Argos. I would need to pay postage from Smyth's if spending less than £20. I don't have a Smyth's near by like many others. Like I said, argos might be better and cheaper for some. You need a character from the dimension you want to enter to gain access. You would need the starter pack as this has the portal which characters have to be placed on and the story pack if you want to play a specific zone Inc all new levels. I get what you mean, and yes the disc (ie. minifigure base) is all you need to unlock the level and world. The level will force you to build Niffler in your case but you can use any vehicle tag/disc. Is lego dimensions available for Nintendo Switch? Heat, but this isnt that great a deal. Most of the packs can be found on amazon etc for around £12. The best value here is to get two story packs. They aren't 342 on Argos when I look seems weird? they will all be reduced in price, as they have offically discontinued this product. These will likely be significantly cheaper next year now that the series has been canned. Over 30 quid for a story pack is still expensive, even if it's bogof. GAME were selling them individually in September for 19.99, just to give you an idea. GAME, people! You need a character from the dimension you want to enter to gain access. …You need a character from the dimension you want to enter to gain access. You would need the starter pack as this has the portal which characters have to be placed on and the story pack if you want to play a specific zone Inc all new levels. I get what you mean, and yes the disc (ie. minifigure base) is all you …I get what you mean, and yes the disc (ie. minifigure base) is all you need to unlock the level and world. The level will force you to build Niffler in your case but you can use any vehicle tag/disc. Seriously went to order these, added to my basket. Went to pay and...... …Seriously went to order these, added to my basket. Went to pay and...... the item I have ordered is now out of stock! What?? Within 6 seconds?? To be fair, anything can go from in stock to out of stock in one second. I just bought the tag discs off people for next to nothing. Not bothered about the Lego as I have quite enough of that, as well as full collections of stuff, so just wanted to play the game. Cheap as chips doing that. Price of these will drop further in the next 6 months as they have announced the end of the series. Exactly... Apart from if they sell out after this deal and none left to reduce ;).